I'm on a review binge. It's long overdue too. So this week, instead of Gattegno Textbook 1, I'm reviewing ATM's latest rods book Cuisenaire - from Early Years to Adult. This book was authored by Simon Gregg, Hellen Williams and Mike Ollerton who are all active members of the #MTBoS (Math Twitter Blog-o-Sphere). I love getting on twitter and looking around at all the stuff these amazing teachers are doing, but I don't have the time. For a couple years, I've been following Simon Gregg's posts. I've often wanted to just hang around his classroom for several days to pick-up ideas and pick his brain. But alas, France is a long way from Iowa. It isn't that this book isn't good, but on page 4 they state that the book is far from exhaustive! What? I think Hellene and Mike didn't consult me with concept development before they pitched Simon. Not exhaustive. They're killing me. I follow these teachers on twitter. I know what they are doing...not even close to exhaustive is right. 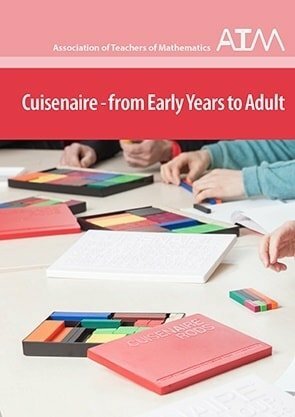 What Is In Cuisenaire - From Early Years to Adult? They are right in that you will find much here for students of all ages. While some of the activities can be found in Gattegno's books, the authors put their own spin on the material. That's worth it alone, because there is no correct way to do Gattegno. And I love to see how others are taking the same exact activity I'm doing and taking it in a completely different direction. 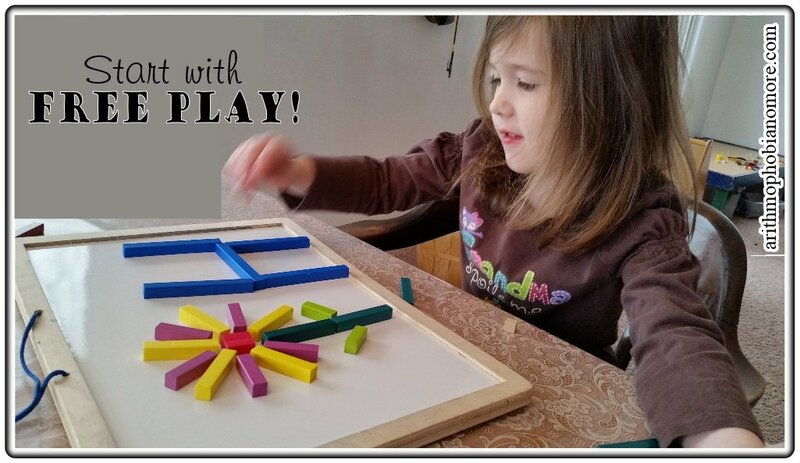 Each chapter provides activities for all ages. Don't assume that because your student knows how to add, that the chapter on adding isn't for you. It is. There are 5 activities in the addition chapter; the last two are for older students. While the book has a lot of activities, I don't think think the activities contained in the book are the primary value. Other than some of the advanced train work, most of the activities you can find elsewhere. That was also disappointing to me. I'm like my friend Lisa who wants to see something new and shiney not something old made new by a different application. But that is why Gattegno works so well. The same structures are used over and over again. The same rules apply. This path allows us to make connections between old information and new information. There isn't a shiny new thing. Not even in this book and that's a good thing. While there isn't a shiny new thing here, the things that I wanted from hanging out in Simon's classroom are packed in here. Simon has a way of sucking every morsel of discovery from the activities he does with his students. It's not easy to pass that information along to another person, but they've done it. So the answer is yes. How to execute the discovery portion is where most people struggle. How do I take what I am doing with my student and turn it into deep exploration? The book is filled with ways to take the child's work and bring it back later to take a deeper look. This is the practical application of Madeleine Goutard's work. For example, there is the 100 Face Challenge. We did that challenge last year and it was fun. 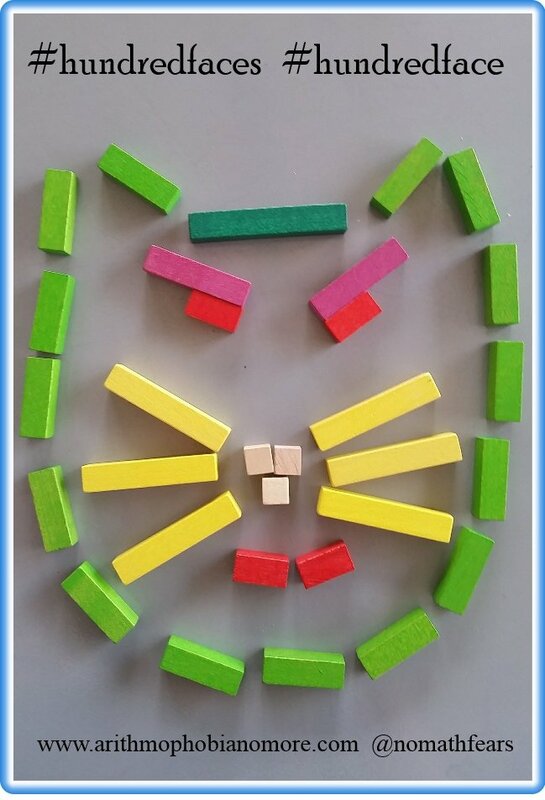 The goal is to create a face made from Cuisenaire Rods that adds up to 100. We played by counting orange rods as 10 until we reached 100. From there, I played banker and P. was allowed to trade any combination of rods for additional rods but the exchange had to be equivalent. That was a ton of fun and we learned a lot from it: there are a whole bunch of ways to make 100; smaller rods can give you more flexibility, but larger rods are easier to keep track of; ten orange rods are much simpler to work with than 50 red rods and on we went. The book took this exercise a step further and would be a great extension for older students. Using pencil and paper, how can you record this so that you can make it again tomorrow or show us later? How brilliant is that little question?! Then try multiple ways of recording and in a couple weeks attempt to reconstruct. Did it work? What went wrong? What went right? Is there a more accurate way to record? What other ways could you record? Do you think those ways would work better? The book is filled with this kind of thing. 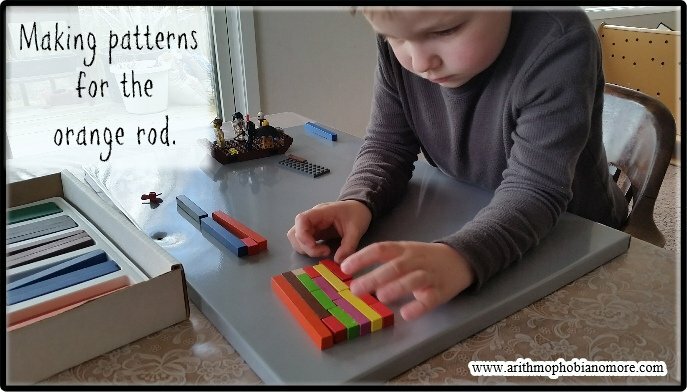 If you are working with multiple age children, they make it easy to differentiate the lesson. The hundred face challenge wouldn't be all that fun for a 6th or 7th grader. Figuring out ways to efficiently keep track of the rods and also record the rods so that you can recreate what you did, now we are talking 6th or 7th grade material. My biggest complaint with this book is that the authors give away the punch line - not every time, but enough of the time that I was like "Stop!". I get that people want the solutions to the problems or at least some direction. But part of the joy of homeschooling is that I get to go to school again. I find playing with Cuisenaire Rods a heck of a lot of fun and it is good for my mind. In future editions, it would be nice if solutions were on a different page or in an appendix. I used to hate it when I had to think, now I hate it when someone steals my "Aha!" moments. I want those and I feel cheated when it doesn't happen. The last issue is probably going to sound petty but it's not. There are a significant number of grammatical errors in the book. I'm not a grammar Nazi, but I do notice when it affects how I understand the material. The book is in sore need of an editor. All things considered, this is an excellent first edition of this book. I am anxious to see if they will write a 2nd version and add more material. I know they have ideas for more material. If you want to find their ideas you can find them on twitter. Mike Ollerton @MikeOllerton, Helen Williams @helenjwc, and Simon Gregg @ Simon_Gregg.